The Jolanda Den Tredjes (Swedish Witch) Tarot, is an esoteric deck of detailed illustrations. Designed by Rosie Bj�rklund, a famous Witch in Sweden, in collaboration with artist Hans Arnold, the pen and ink drawings are rich with detailed symbolism and follow a mixture of traditions. 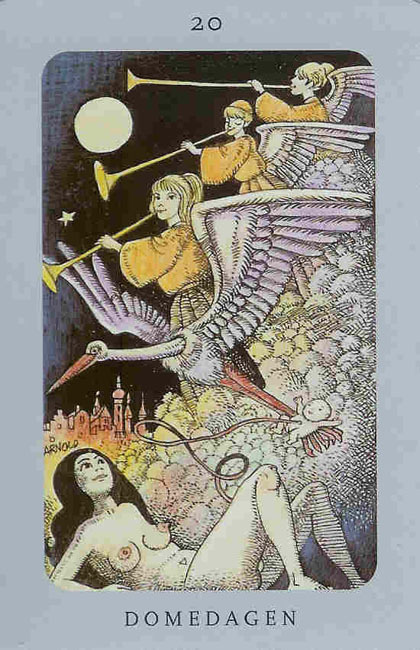 The Judgement card has angels blowing their trumpets over a woman who has recently given birth - the baby is still attached to her by a cord, although there is a stork carrying it.